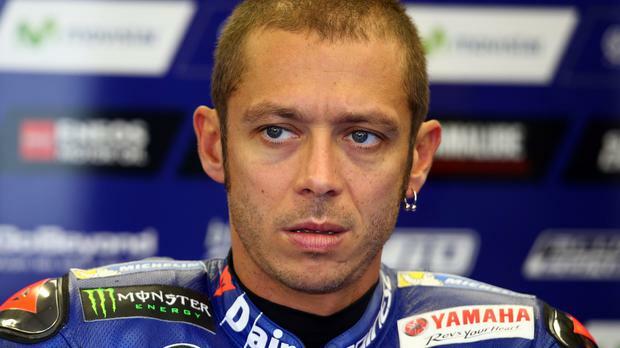 FOR the first time since Misano returned to the MotoGP calendar in 2007, Valentino Rossi will miss his home race. Movistar Yamaha confirmed the news the Italian legend’s home fans feared on Monday in the wake of the motocross crash last week which left Rossi with a broken right leg. The 38-year-old underwent surgery in Ancona in Italy on Friday to have a nail installed in his tibia to aid recovery, discharging himself from hospital the following day. The second race in Italy each year, the San Marino round is regarded as Rossi’s ‘home’ event over the Italian GP at Mugello given the Misano circuit’s proximity to his home town of Tavullia, less than 20 minutes up the road. Yamaha will not field a replacement rider for Rossi, leaving Maverick Vinales to fly solo at Misano.The race is also the first that Rossi has missed since 2010, when he broke the same leg during practice at Mugello and was forced to miss four grands prix.Rossi currently sits fourth in the championship standings, 26 points behind unexpected title contender Ducati’s Andrea Dovizioso. His absence at Misano means that deficit will extend to, at most, 51 points if the Ducati rider wins the race. On leaving hospital Rossi vowed to get back on his bike as quickly as possible. “I will begin the rehabilitation as soon as possible and we’ll see how my body reacts before making any decisions,” he said.“It will depend a lot on him but I think that he will have to rest at least 40 days,” Dr. Raffaele Pascarella, who carried out the surgery, suggested on Friday. Neither Rossi nor Yamaha have confirmed whether he will take part at the Grand Prix of Aragon a fortnight later — which is within the 40-day recovery window — or if he will return at the Grand Prix of Japan on October 15, the first of three flyaway rounds in three weeks that includes the Australian Grand Prix on October 22. Should he return in Japan, Rossi’s points deficit could be as much as 76 with a maximum haul of 100 on offer from the final four races of the season, making his bid for an eighth MotoGP world championship and 10th world championship across all classes unlikely. The Movistar Yamaha MotoGP Team regrets to report that Valentino Rossi will not be able to compete in the upcoming Gran Premio Tribul Mastercard di San Marino e della Riviera di Rimini, to be held this weekend. The Factory Yamaha team will compete in round 13 of the 2017 MotoGP World Championship with Maverick Viñales as its sole rider. The whole of Yamaha wishes Valentino Rossi a speedy recovery and hopes to see him back on his YZR-M1 as soon as possible.